Should I major in music? “Looking back it was a good experience. At the time it felt scary." THE SAINT MARY'S COLLEGE WOMEN'S CHOIR, a select 40-voice ensemble, regularly commissions and performs new works for women's voices. An outgrowth of this emphasis is the publication of the Saint Mary's College Choral Series, a collection of new works for women's voices, published by earthsongs of Corvallis, Oregon. The Choir has performed throughout the United States and has appeared before state and division conventions of the Music Educators National Conference and the American Choral Directors Association. In February 2005, the Choir appeared before the national convention of the American Choral Directors Association in Los Angeles, performing in Wilshire Christian Church and the new Walt Disney Concert Hall. Each November the Choir hosts the annual Saint Mary's College High School Women's Choir Festival, in which 20 choirs from neighboring states perform for each other and a panel of commentators. The Choir tours nationally every other year, and regularly performs with the University of Notre Dame Glee Club in joint performances of major works with the South Bend Symphony Orchestra. They have appeared in concert at Carnegie Hall in 1999 and 2001, and returned there in November 2005 to perform music by Gwyneth Walker for women’s voices and orchestra. The Women’s Choir has recorded four compact discs on the ProOrgano label: Ave, Ave!, recorded in 1997, Amazing Day!, recorded in 2002, Anima mea!, recorded in 2004, and Across the Bar..., recorded in 2007. 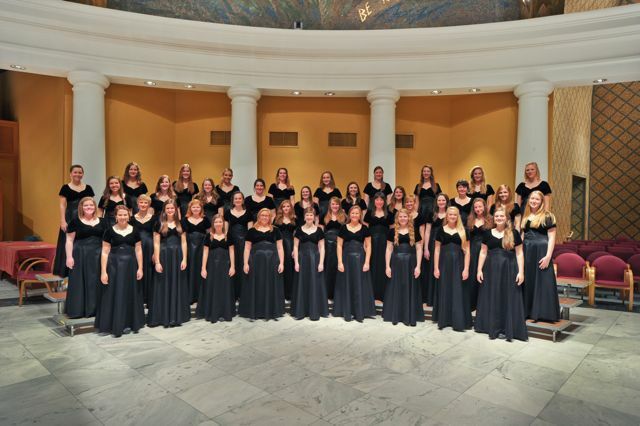 The Saint Mary's College Women's Choir tours nationally every other year during the spring semester. Past tour have taken the Choir throughout the US and to several Canadian cities. In March 2011 the Choir took a fantastic spring break tour to China, visiting Shanghai, Nanjing, and Suzhou. Last March we visited Indianapolis, Louisville, Nashville, Atlanta, and sunny Ft. Lauderdale. Composers Gwyneth Walker and Paul Carey with Nancy Menk. to work with the SMC Women's Choir. The Women’s Choir’s first compact disc recording, “Ave, Ave! Twentieth Century Music for Women’s Voices” received an excellent review in the November 1998 issue of The Diapason, a national journal for organists and church musicians. Among the positive comments were the following: “. . . the conductor, Dr. Nancy Menk, revels in, and at times bathes us in, pure vocal effects and rich sonorities . . . Flawlessly executed avant garde vocal techniques abound . . .”. Their second CD, "Amazing Day!" was released on the ProOrgano label in 2002, and in 2004, they "Anima mea! New Music for Women's Voices"
In the spring of 2007 they released "Hearken All! ", a compilation of Christmas music from the Madrigal Dinners presented at Saint Mary's College. This disk comes in a fiber-board sleeve rather than a jewel case. The latest CD, released in the fall of 2007, is "Across the Bar". To order CDs directly from Saint Mary's College, choose an item from the drop-down list, then click the "Buy Now" button. To order several CDs at one time, send us an e-mail stating what you want. We will send you an invoice to be paid through Google. We use the secure Google checkout for all credit card orders. Price includes shipping and Indiana sales tax. Choose domestic (US) or foreign shipping when ordering. 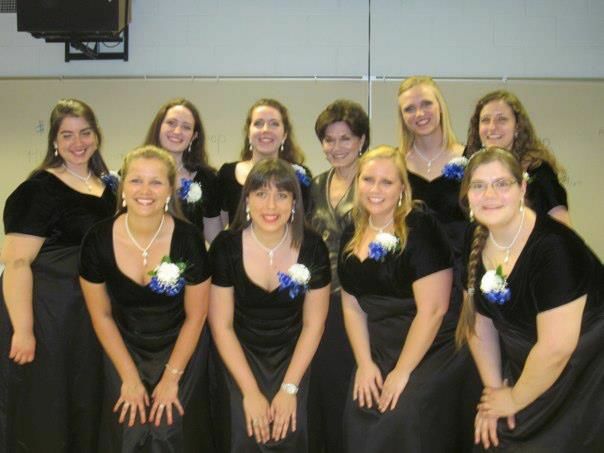 Singing in Women’s Choir has been a very positive experience during my first year at Saint Mary’s College. This choir is so different from my high school choir — the pieces we sing are challenging but fun, and it is much more enjoyable to sing with a group of women who come to choir because they love to make music. I am anxiously awaiting next year’s tour, and I look forward to the new experiences Women’s Choir will bring! As a first year, I felt very welcomed by everyone in the choir. 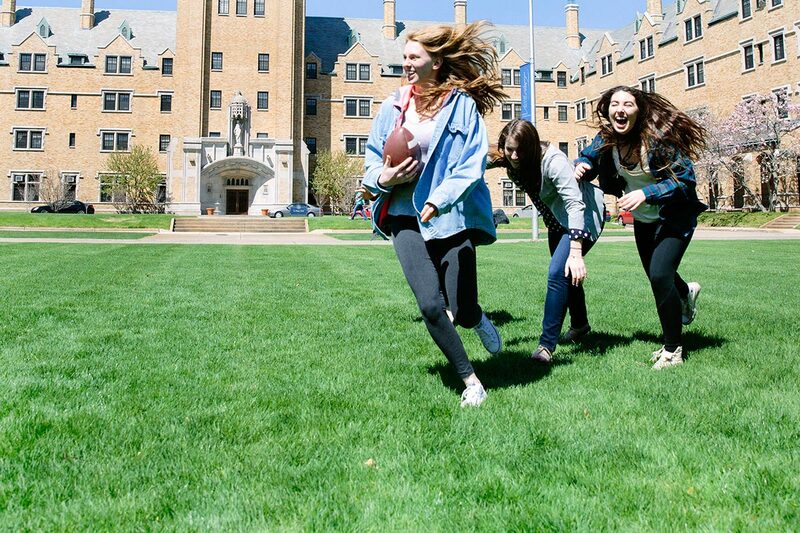 I received a good deal of support and encouragement from my peers because here at Saint Mary’s, we tend to help each other instead of compete with each other. The Saint Mary’s College Choral Series is a collection of select new music for women’s voices edited by Dr. Nancy Menk. Music in the series is available from the publisher, earthsongs. Carol Barnett: Song of Perfect Propriety (ssa, piano) Dorothy Rothschild Parker was one of the most accomplished and successful feminist literary writers in women’s history. Minnesota composer Carol Barnett’s setting of Parker’s Song of Perfect Propriety was written for the Cornell University Women’s Chorus as part of a commissioning project unofficially called “No Whining, No Flowers,” in which women composers were asked to set texts by women on topics other than the above. Wonderful text painting! Michael Cleveland: Pie Jesu (ssa, opt. piano) (latin) This beautiful, mostly homophonic piece opens with a tender plea for comfort and eternal rest. The middle section expresses the mood of the more joyful procession of the soul’s entrance into heaven, then a brief return of the original statement brings the piece to a close. Works well a cappella, but an optional accompaniment is provided. Medium difficulty. Tae Kyun Ham: Kashiri (S, ssaa, piano) (korean) This very dramatic setting of a traditional Korean poem was first composed for mixed voices and then arranged for female chorus for the Seoul Ladies’ Singers who performed it at the 1993 IFCM World Symposium in Vancouver and at the 1995 ACDA National Convention in Washington, DC. Difficult, but very effective and worth the effort! Requires a good pianist. William Hawley: Ave Maria (sssaaa) (latin) A beautiful, lush, a cappella setting of the traditional Ave Maria text by New York composer William Hawley, whose works have recently been performed and recorded by the Gregg Smith Singers, the Dale Warland Singers, and Chanticleer. The piece builds to a gorgeous polyphonic climax based on a falling motive. Moderately difficult, but well worth the effort. William Hawley: Alma Redemptoris Mater (sssaaa) This setting of the Marian antiphon by American composer William Hawley completes a decade-long commissioning project between the Saint Mary’s Women Choir and the composer that involved setting each of the 4 Marian antiphons for 4 different voicings. This final setting continues Hawley’s trademark harmonic writing and formal structure with beautiful effect. Difficult. William Hawley: Regina Caeli (ssa) (latin) This setting of the Marian antiphon begins with chant and then expands into intricate, three-part polyphony. Beautiful! Medium difficulty. William Hawley: Ave Regina Caelorum (sssaaa) (latin) Another beautiful, lush, a cappella setting of the Marian antiphon, composed by New York composer William Hawley for the Women’s Choir’s March 2002 tour. Difficult, but well worth the effort. William Hawley: Salve Regina (saaa) (latin) The third in Hawley's beautiful a cappella settings of the Marian antiphons, composed for the Women's Choir's March 2004 tour. Freely composed in polyphonic and homophonic passages, as well as in textures integrating both approaches. Difficult. Andrejs Jansons: Two Latvian Carols (ssaa) (latvian/english) Ziemas svetki sabraukusi, a Latvian folksong which describes the coming of the steed of Winterfest, and Balts sniedzins snieg uz skujinam, an original carol which describes the joy of riding on the sleigh to church on Christmas eve, with “sleighbell” accompaniment. May be sung in Latvian or English. A translation is provided and a pronunciation guide and tape are available. Easy. Ron Jeffers: Missa Brevis in tempore violentiae (ssaa) (latin) This short mass ( Kyrie and Gloria) was composed for ELEKTRA, an excellent women’s chorus from Vancouver, BC. The Kyrie is a cry for mercy with a different dynamic and sharp dissonances in contrast to many other settings of this ancient text. The more joyful and exuberant Gloria offers a contrasting tempo, texture, and character to the Kyrie. Difficult. Ron Jeffers: The Salutation of the Dawn (ssaa) This is a primarily homophonic setting of a poem Kalidasa, generally regarded as India’s finest Sanskrit poet and dramatist. The often-set phrase “Look to this day” is set in fanfare-like imitation in this majestic piece. Ron Jeffers: The Serpent (ssa) Oregon composer and publisher Ron Jeffers sets Theodore Roethke’s humorous poem about the “serpent who had to sing” with rhythmic vitality and mild dissonances that help to bring the story to life. Medium difficulty. Ron Jeffers: To a Long Loved Love (ssa) Mild expressive dissonances seek to convey the spirit of the sensitive thoughts of this poem from Madeleine L’Engle’s Weather of the Heart. A challenging piece, but very possible for good choirs. Ron Jeffers: Victimae paschali laudes (ssaa) (latin) These three pieces are all based on the well-known Latin sequence for Eastertide. In the first the various moods of the text are heard as the original Gregorian chant is presented canonically and heterophonically. The second is a chromatic variation of the chant which emphasizes the agony and the pain of the Victimae. In the final setting the original chant is part of shimmering whole-tone clusters of sound that offer laudes (“praises”). Difficult. Ron Jeffers: Warning (ssa, 2 flutes) The well-known poem by Jenny Joseph (“When I am an old woman”) is most audacious and full of “warnings” from a lady who plans to grow old in her very own, strongly independent way. Humorous and challenging. Theodore Morrison: French Songs for Treble Voices (ssaa/sma) (french) The fluid rhythms and voluptuous harmonies of these lovely choral settings are reminiscent of Hindemith’s “Six Chansons,” but these settings of the German poet Rainer Maria Rilke’s original French poems (La Biche, Puisque tout passe, and Un Cygne) provide a fresh musical approach to the melodious texts. Medium difficulty. Zae Munn: Grandma’s Alleluia (ssaa) Ann Kilkelly’s text provides a memorable and moving portrait of “Grandma” who, despite family resistance, decides to embark on a train trip from St. Paul to Montana to visit her cousin Marge. She is lulled by the repetitive sounds of the train into memories and dreams of her past. As she remembers, she rejoices in her life. Medium difficulty. Zae Munn: The Muse, The Stove, and The Willow Plate (ssa) A set of three poems by Ann Kilkelly. In the first a poet bemoans the fact that her muse is a bit more troublesome than most. The second describes a woman who rebels against her cantankerous old stove by pounding it to bits. And in the third, a woman uses the images on a willow plate to sing a love song. Medium difficulty. May be performed separately. Jonathan Pieslak: Scântei solare (Solar Flares) (ssaa) (Romanian) New York composer Jonathan Pieslak arranged one of his earlier piano etudes for 4-part women’s voices a cappella. His wife Sabina then wrote a text in Romanian that fit with the music. Constant metric shifts and displaced accents add to the excitement of the very colorful music. This is a favorite of the Saint Mary’s Women’s Choir. A CD Pronunciation guide is available from the publisher. Michael Sitton: Ubi Caritas (ssa/ssa) (latin) This setting of the Maundy Thursday antiphon is for double ssa choir, a cappella. Virginia composer Michael Sitton uses a strict rondo form, treating the two choirs antiphonally at times, but bringing them together for the returning Ubi caritas theme. The piece increases in intensity for the final gaudium quod est immensum . . . (“and let there be immeasurable joy both now and for evermore”), and closes quietly on the lovely final refrain. Difficult. Gregg Smith: Jamaican Songs (ssa, violin, piano) (English) Four pieces (Sing, The Road, Let Us Build, On this Night) published separately, based on poetry by George Campbell, Jamaica’s revolutionary poet laureate. Interesting accompaniment by the violin and piano complements the primarily homophonic setting of these politically-charged texts. Gregg Smith: Latin Madrigals (MS, ssa, piano) (latin) Echoes of Gershwin and other jazz idioms can be heard in these attractive settings of three secular Latin poems (Redit aestas, Importuna venerit, Ver redit). Choral music’s foremost champion of American music writes with skill and authority for treble voices and a good pianist. Translations provided. Nancy Telfer: Butterfly (ssa) From the stillness of the cocoon to the first uncrumpling of frail wings to the joys of first flight, this imaginative piece by one of Canada’s most prolific composers flitters and darts and soars and then disappears, leaving only a soft humming sound. An especially delightful piece for children’s choruses. Medium difficulty. Nancy Telfer: The Blue Eye of God (ssaa) Dolphins, herons, humpbacks and orcas all play a part in this setting of a strong ecological statement by the Canadian poet Barbara Powis. Sharp dissonant cries contrast with whispered murmurings, and long arching melodies stand out in bold relief against imaginative accompanimental textures in this well-written piece. Demanding vocally and interpretively, but very possible for good choirs. Clyde Tipton: Songs of Innocence (ssa div) This is a set of five short pieces with texts by William Blake (Little Lamb, Spring, The Shepherd, Nurse’s Song, and Laughing Song). The songs make use of a wide variety of textures from unison to eight parts, and several require soloists. May be performed separately. The Saint Mary’s College Department of Music sponsors the High School Women’s Choir Festival, held each year in O’Laughlin Auditorium. 20 choirs from four states (IN, IL, MI, OH) participate in this annual event. Each choir performs a program of three or four pieces for each other and a panel of guest commentators. Following their performance, each receives written comments from two of the commentators, while a third works with the choir on stage in an open-rehearsal format so that all in attendance may observe. A highlight of each day is a noontime performance by the Saint Mary’s College Women’s Choir. Lunch in the Dining Hall is provided for all participants, and campus tours are included. In honor of the 15th anniversary of this festival in 1999, the event was celebrated in New York City at Carnegie Hall with a concert of music for women's voices and orchestra, under the direction of Dr. Nancy Menk. In honor of the 30th anniversary of this festival in 2014, the event was celebrated in New York City at Alice Tully Hall with a concert of music for women's voices and orchestra by Gwyneth Walker, including a new work written especially for the occasion, under the direction of Dr. Nancy Menk. The 31st annual Festival will take place on Thursday, November 19 and Friday, November 20, 2015. This year’s commentators are Jonathan Busarow, Artistic and Executive Director of the Fort Wayne Children’s Choir, Kerry Glann, Associate Director of Choral Activities at Ball State University, and Joni Jensen, Director of Choral Activities at Texas Woman’s University.